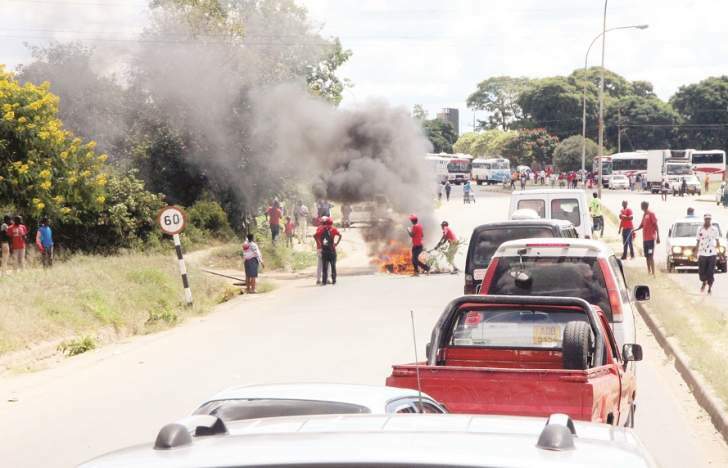 Rowdy MDC-T supporters barricade the road with burning tyres ahead of Advocate Nelson Chamisa's rally at White City Stadium yesterday. THE Advocate Nelson Chamisa-led MDC Alliance, in a bid to fool the world that it commands a large following in the country, yesterday bused in thousands of supporters from as far as Chitungwiza and Harare to their "Siyanqoba" rally that was held at Bulawayo's White City Stadium. The rally, which was Mr Chamisa's first ever in the country's second largest city since he grabbed power while the party was morning its founding president Mr Morgan Tsvangirai in February, also began on an ugly note with the party's unruly youths blocking parts of Hyde Park Road with burning tyres forcing motorists to divert and use Khami Road. "We came here to support our president," said a supporter inside a bus. The bus was part of 10 others from the same company which brought supporters from Chitungwiza and had a Unit N Seke address emblazoned on them. He told party supporters that before coming to the rally he had earlier visited Dr Nkomo's house in Matsheumhlophe, which has since been turned into a museum in honour of the revolutionary icon. He claimed the Nkomo family had told him that he was the first "national leader" to visit the museum ever since Dr Nkomo's death in 1999. "I was so touched when I went to Dr Nkomo's Matsheumhlophe house. I was going there to see the history of this nation. However, the family told me one thing, they said ever since the death of Dr Nkomo I am the first national leader to visit the house, they even offered to give me Dr Nkomo's traditional knobkerrie. Our late leader, Morgan Tsvangirai represented what Dr Nkomo represented, this being unity, peace, tolerance and giving oneself to the people without being selfish. That is what President Tsvangirai represented, so I am walking in the footsteps of president Tsvangirai and VP Nkomo," said Mr Chamisa. "When we get into power I promise you that we will build a whole shopping mall that will be in honour of Dr Nkomo, this mall will also have museums in honour of our late Vice-President and will be dedicated to his legacy. I have also instructed Bulawayo Mayor (Martin Moyo) and his deputy (Gift Banda) to ensure that they exempt the foundation from paying rates and rentals. We will also make provisions for a social grant for the Joshua Mqabuko Nkomo Foundation once in power as a means of honouring his leadership," said Mr Chamisa. The Alliance leader once again reiterated his absurd promise of bringing bullet trains and "spaghetti" roads once in power. "There are a lot of things which my government will do which some think are impossible. We want Matopo, for example to be the centre of our cultural festivities so that every year there are festivals to celebrate our culture. We will build new cities, Matopos will be elevated to a city status, its possible, some might think it's impossible but we will prove to you all that it is possible. We will help you see reality from our perspective, they can laugh on our vision for bullet trains and spaghetti roads, but it is very possible," said Mr Chamisa. Mr Chamisa also took the opportunity to warn estranged former MDC-T deputy president, Dr Khupe not to mislead herself and her backers that they would use the party's name saying they had already put in place mechanisms to block her from any attempts to do such. "I know there are some people that have been going around claiming that they will be using the party name for their own unscrupulous agendas. I would like to state it clearly to you all that no one will be allowed to do such, we have in place all the mechanisms to prevent such hence they should just forget and find their own name," he said. Meanwhile, addressing the rally, MDC-T national chairperson Mr Morgan Komichi warned party members to stop allocating themselves constituencies saying that was still being discussed at alliance level.